A COMPLETE AND PRACTICAL LIBRARY. - 1867 - 506 pages. 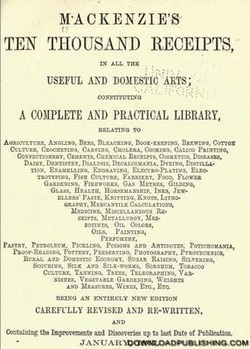 Agriculture, Angling, Bees, Bleaching, Book-Keeping, Brewing, Cotton Culture, Crocheting, Carving, Cholera, Cooking, Calico Printing, Confectionery, Cements, Chemical Receipts, Cosmetics, Diseases, Dairy, Dentistry, Dialysis, Decalcomania, Dyeing, Distillation, Enamelling, Engraving, Electro-Plating, Electrotyping, Fish Culture, Farriery, Food, Flower Gardening, Fireworks, Gas Meters, Gilding, Glass, Health, Horsemanship, Inks, Jewellers Paste, Knitting, Knots, Lithography, Mercantile Calculations, Medicine, Miscellaneous Receipts, Metallurgy, Mezzotints, Oil Colors, Oils, Painting, Perfumery, Pastry, Petroleum, Pickling, Poisons and Antidotes, Potichomania, Proof-Reading, Pottery, Preserving, Photography, Pyrotechnics, Rural and Domestic Economy, Sugar Raising, Silvering, Scouring, Silk and Silk-worms, Sorghum, Tobacco culture, Tanning, Trees, Telegraphing, Varnishes, Vegetable Gardening, Weights and Measures, Wines, Etc., Etc.